Regular readers will know that I like, appreciate and share public art. I often wonder whether artists know how their artworks affect people after all the critics have been to visit at the time of unveiling. This particular art installation in Schwalbach am Taunus, Germany is now 10 years old. Prof Gerhard Schweizer from Darmstadt created this avenue of concrete blocks to commemorate El Lissitsky. The Russian artist had studied in Darmstadt in the early 1900’s followed by stints with Marc Chagall in Vitebsk. He died in 1941 having influenced the Bauhaus and constructivist movements and having artwork featured in Dadaist publications. 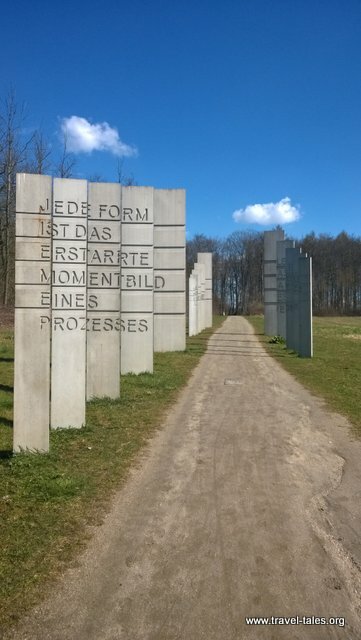 The installation takes the form of an avenue of concrete blocks into which text has been inscribed. As you walk along the avenue perspective changes how the blocks appear and the text becomes and un-becomes aligned to be readable. Plaques in the ground accompany the concrete blocks and standing on them you can read the same text on the plaque and the concrete blocks.